I guess I’ve told it all right there in the title. I’m not into being cryptic about things like this and tire of reading teaser headlines that force you to click to read the story to find out what their ultimate view is. If you’ve clicked to read this article then you are looking for my reasoning behind stating right off the bat that I don’t feel Amir Khan has what it takes to defeat Floyd Mayweather should he be successful in becoming Mayweather’s final opponent. I’ll start by saying that I am not an Amir Khan hater. I’ve watched Khan’s career since long before the knockout loss he suffered at the hands of Breidis Prescott back in 2008. What I’ve always seen in Khan is a very talented, and gutsy, fighter who has all the tools to become one of the best fighters of his era, but for some reason isn’t able to pull everything together every time he fights. 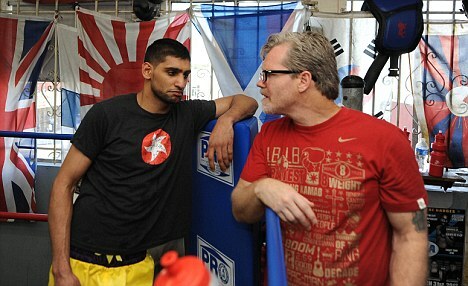 Khan picked up the pieces after the Prescott loss by aligning himself with Freddie Roach and going on to capture two world titles in the light welterweight division. Roach focused on improving Khan’s attack to utilize the natural hand and foot speed advantage Khan held over many other fighters. The results were immediate and impressive, for the most part. 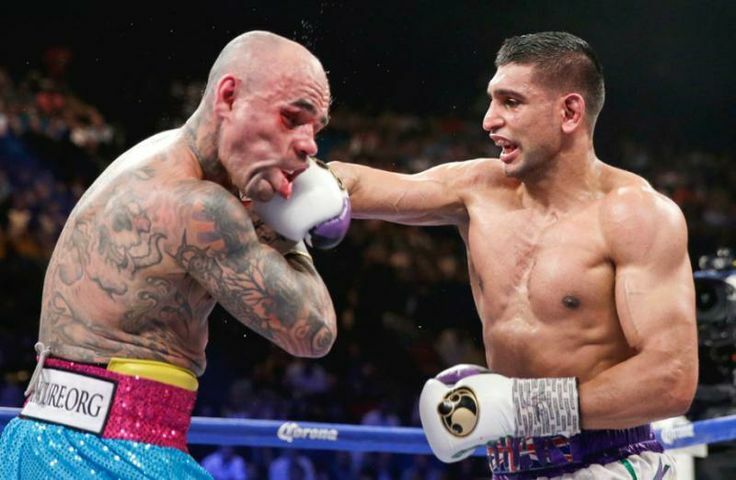 Worrisome aspects of Khan’s fight game were the fact that he left openings that were exploited by Marcos Maidana and Danny Garcia leading many evaluating Khan to feel that Roach had done nothing to improve his defense. Khan obviously came to the same conclusion as those in the media as he parted ways with Roach and aligned himself with Virgil Hunter, trainer of the defensively sound super middleweight champion Andre Khan. The Mayweather angle for Khan has gone on for years. While under Roach’s tutelage and making waves through the light welterweight class, Khan spoke often of his desire to step up in weight to challenge Mayweather. 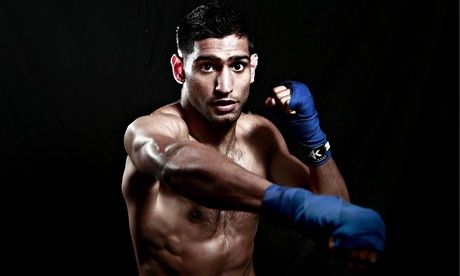 Khan felt his speed would be a critical factor in a bout with Mayweather and lead him to victory. That belief has not changed even through the losses to Lamont Peterson and Danny Garcia, nor with the change in trainer and fighting style. This change in fighting style has me, and no doubt many boxing fans, watching closely to see if it gives Khan any chance to seriously challenge Mayweather if he gets his wish and is able to share a ring with the pound-for-pound king. My evaluations of Khan’s progression under Hunter make me feel that while Khan will have a longer and more successful career under Hunter’s guidance, he actually has less chance of beating Mayweather. This belief has been compounded by Khan’s last three fights under Hunter’s guidance. Hunter has done exactly what Khan needed for his career. He’s taught him how to be patient, how to stay within range but without increasing risk of being hit all so he can capitalize quicker on mistakes. He’s also taught Khan tricks for how to better protect his chin, not that I agree it’s a weak chin but more that simple errors Khan made he is now avoiding. One such error, and one reason he will not beat Mayweather, is Khan’s inside game. This is the worst area by far of Khan’s fighting ability and is clearly one Hunter has worked hard with Khan on. 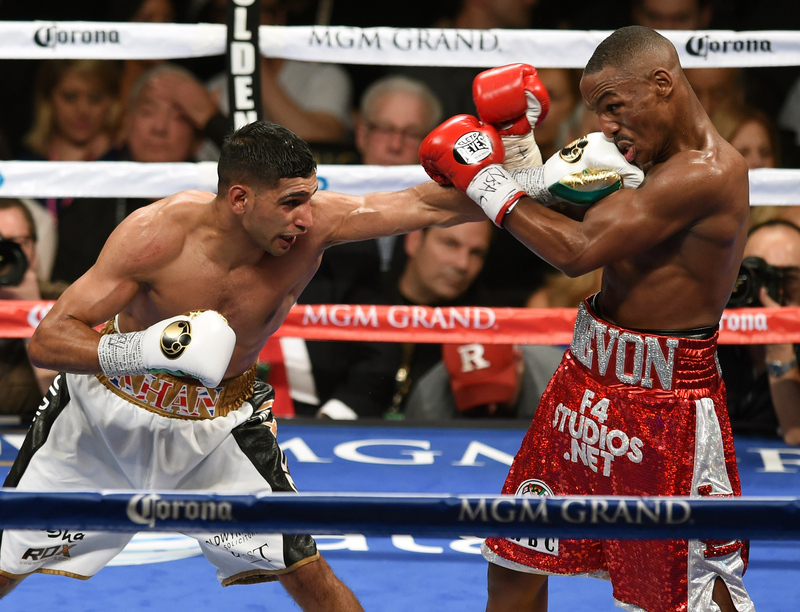 Against Louis Collazo and Devon Alexander in 2014, Khan was widely praised for his victories and rightly so. Khan faced dangerous opponents and made relatively easy work of them. He did so by avoiding any and all fighting on the inside. Every time either man closed the distance, Khan grabbed hold. As Khan’s style is not about slipping and ducking punches (he tried that technique earlier in his career and Willie Limond and Michael Gomez almost made him pay) fighting on the inside is dangerous. While Khan can land heavy punches on the inside, he cannot avoid them and being there is a mistake. This plays into the portion I was talking about with having a longer and more successful career but being less likely to beat Mayweather as a result. Being able to avoid inside battles will reduce the risk of knockout losses, or being staggered by heavy shots. However, Mayweather is equally adept on the inside as the outside and can often draws people in close to land on the inside while slipping their shots. Mayweather would invite Khan in, and Khan would come feeling Mayweather doesn’t have the power to hurt him. He’d be wrong and be bullied on the inside. Against Algieri I saw a glimpse of what could happen if Khan faced Mayweather and was suckered inside. 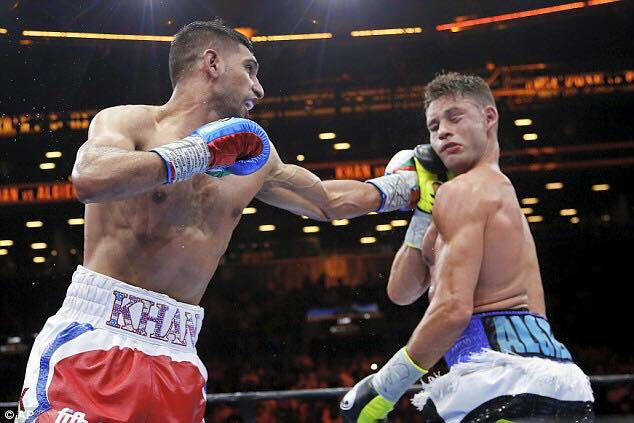 Late in the fight, Khan showed he’s worked a little on his inside skills as he went in and fought Algieri up close. Khan landed a very nice uppercut, but ate two shots in the process. He showed that while he’s added some punch selection on the inside, he still cannot read punches and slip them. False confidence in being able to now punch on the inside could lead to willingly battling it out in close quarters with a man who can land and slip from all angles. Mayweather would stop Khan if they fought on the inside with one another. The next worrisome part from Khan’s standpoint should he get the bout with Mayweather is the ease with which right hands can tag him. While Hunter has worked with Khan on getting his hands up after combinations to limit counters, he seems to have missed on critical aspect that could be Khan’s undoing against a fast handed, ring aware fighter. It should have been his undoing against Algieri save the fact that the native New Yorker didn’t exploit the opening as he should have and made the wrong selection when he did. Hunter has Khan circling closer in than he used to, staying in range for exploiting mistakes his opponent makes as well as eliminating the need to dart in and out in a straight line. In spite of being in range more often, Khan is actually tougher to tag with clean shots with this movement. However, Algieri saw a repeated mistake Khan made that he tried to capitalize on but didn’t have the right punch selection to do so. When Khan finished circling and steadied for an attack he stopped, planted his feet, dropped his left and readied to attack. Sometimes the attack was instant, forcing Algieri to block and parry. Other times he left enough time for Algieri to fire a shot over the low right that was sitting below the shoulder line and leaving his chin open. Algieri rocked him in the first round taking advantage of this, and tagged him a few more times throughout the fight. 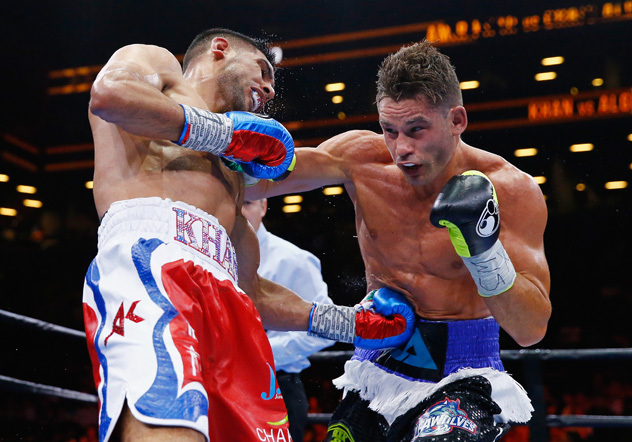 When Algieri threw a shot over Khan’s low right he through a swinging hook. Some landed, others Khan saw coming and avoided or blocked. Algieri has the hand speed and reach to have thrown a straight right that would have been a faster and harder to see punch, thus improving his accuracy and troubling Khan more often. If Floyd is contemplating fighting Khan he would have watched this bout and have seen the low left already. While Floyd doesn’t watch much tape of his opponent while training to face them, he would already know that Khan will leave him a low left often throughout the fight. If you’ve watched many of Mayweather’s recent fights one of his favourite attacks is to wait for the gap he’s seen, snap out a straight right then duck under the return fire and spin away. Another HUGE advantage he would hold in a bout with Khan. For me a bout with Mayweather is something Khan will not win. 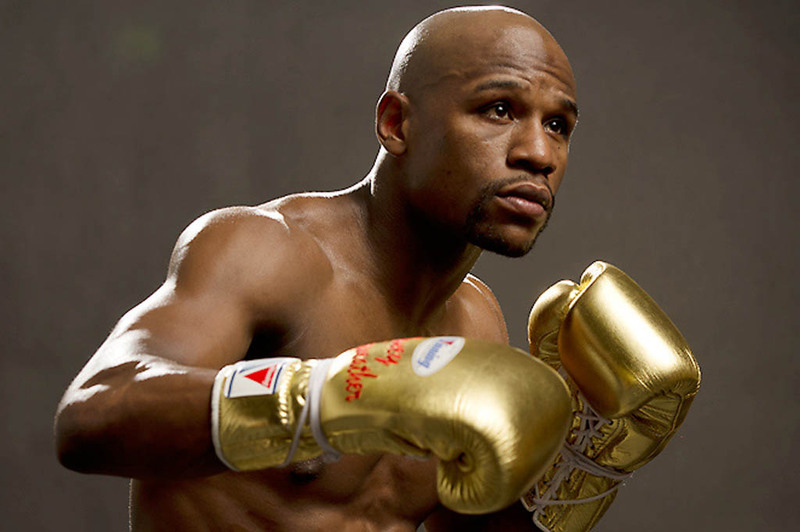 Mayweather’s fighting style is to adapt during the fight to his opponents strengths and weaknesses. In the past, Khan had a relentless, speedy attack that Mayweather would have had to weather while watching for holes. He would have seen the low hands on retreat and looked to counter there, but he would have also seen a pattern in when Khan darted in for a flurry and simply beat him to the punch. Fast forward to now and Khan has simply moved the weaknesses over to other areas rather than fixing them. Mayweather would spend the early rounds letting Khan circle around him and then popping him with the straight right then spinning away to do it again. Frustrated, Khan will lose composure and resort to his old type of trying to bull-rush Mayweather, which will leave opportunities for Mayweather to hit Khan as he rushes in and then be gone when Khan looks back up. Hunter will calm his man down and help him regain his composure and they will look to press Mayweather late to see if his age is catching up to him and he’s tired down the stretch. Mayweather will see this and sit on the ropes, inviting Khan in. Khan will feel Mayweather is tired and there for the taking and will try to use his new in-fighting punches. Mayweather will slip them, land a few hard counters and look to stop Khan late in the bout. Putting it simply, a bout with Mayweather will make Khan a very rich man, but would not be a bout he could win. As a result all of Khan’s bluster about how his speed is too much, how Mayweather has avoided him and how Mayweather’s father has supposedly told Khan in person that he is the only man who could beat his son will make Khan look incredibly foolish. While many fighters suffer no ill from losing to Mayweather, all Khan’s preamble could turn into the beginning of the end for him as a top-level fighter when he loses. Enter your e-mail address to receive updates from the Donkey.